I’ve been loving hanging out in Frank & Dean (or Frank X Dean) lately. The ambiance is cool and I super love the service. I don’t have the words ‘blogger’ written on my forehead but I just dig how they let me power my gadgets for free and one time they event lent a charger for my Samsung phone. How many establishments can actually do that? Regardless of the food or the pricing, good service really racks up points in a customer’s memory. So I figure that if I were a full-time digital nomad, I’d be hanging out in Frank & Dean all day. Except that I’ll totally fatten myself up eating their delicious pancakes and whatever calorific items are on the menu. 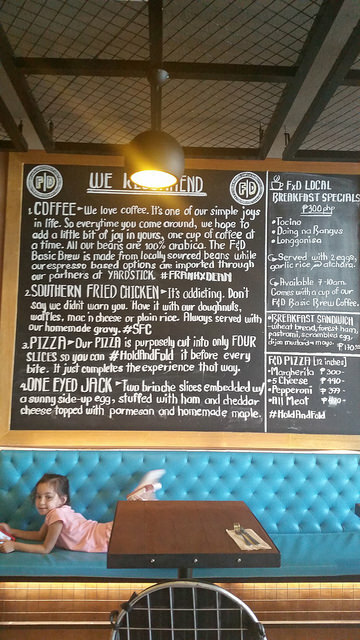 The place prides itself of their fried chicken, and I must say it’s really flavorful, if not addicting. The Southern-style fried chicken, paired with two pieces of the yummy house-made doughnuts (P260), might as well be the ultimate kiddie comfort food. Except that the adults seem to be ordering a lot of this too. Note: the chicken can also be paired with mac & cheese, waffles or rice. Just ask the server or look at the menu. The pepperoni pizza is decent. My friends and I devoured this one night while sipping cocktails in the second floor al fresco area. I liked the vibe. There was even a DJ playing. Tip: the young ones seem to prefer going to the secret speakeasy bar in Frank X Dean called the Ocean’s Telephone Company. It’s a sort of hole-in-the-wall, lounge area that’s jampacked during weekends. But I just couldn’t stand the smoke-filled atmosphere…whew. The Electric Meal (P280) is a low-calorie, except that they probably should change the half a cup of white rice to brown. I loved the juicy and tender grilled chicken fillet that came with this. The addition of sliced bananas is a nice touch. The fettucini carbonara didn’t disappoint. I also dig their smoked salmon on rosti (or homemade hash) with poached eggs, sour cream and arugula (P350). Just a warning: the serving size is quite small if you have a big appetite, but just okay if you want to eat like the French, lol. Am seeing a lot of restos offering coffee from Yardstick. Frank & Dean is no exception.